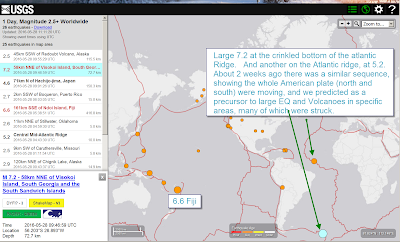 Nuke Pro: Earthquake Alert Re-Upped, 7.2 on the "American Plate" The Whole Plate Is MOVING! Earthquake Alert Re-Upped, 7.2 on the "American Plate" The Whole Plate Is MOVING! The entire North and South American plates are moving again in unison. This is a bad sign, and forebodes large earthquakes and volcanoes. Large 7.2 at the crinkled bottom of the atlantic Ridge. And another on the Atlantic ridge, at 5.2. 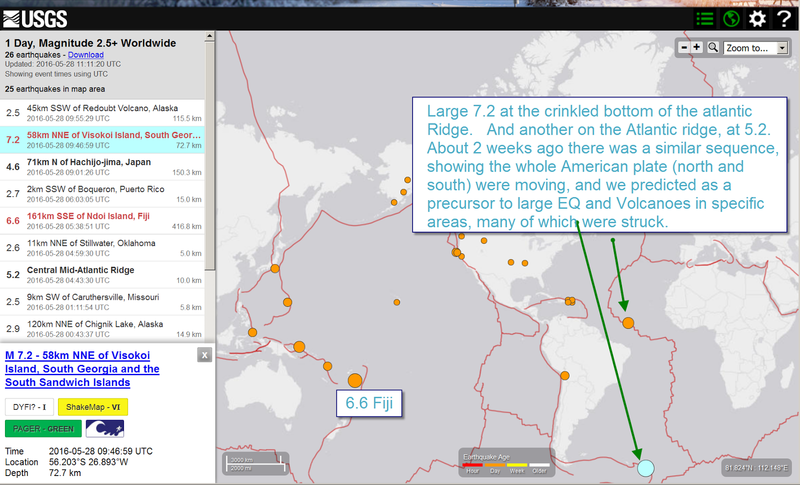 About 2 weeks ago there was a similar sequence, showing the whole American plate (north and south) were moving, and we predicted as a precursor to large EQ and Volcanoes in specific areas, many of which were struck. From a web source==this is another topic, but I wanted to preserve this information, so it is here. Decay energy is measured in electron volts (eV), a measure of the particle’s momentum. 1 MeV is 1,000,000 eV, and 1 keV is 1,000 eV. According to the table, Plutonium 239 is the most dangerous internal emitter, but the hazards to public health depend on the relative quantities released and the relative quantities that people actually absorb. Some segments of the population are more vulnerable than others. Is it a matter of a single exposure or a continual exposure and accumulation? What parts of the body do different particles tend to go to, and how long on average do they tend to stay in the body (the biological half-life)? None of this complexity can be conveyed with a map and a simple declaration of a “safe” limit of external gamma radiation exposure. Pardon, but Table 1 doesn't seem to fit this article. Wherever it does belong, perhaps some toxicological data might fit with it. After all, they are not only biologically harmful via radioactive decay alone. U can replace Mg, Pu can replace Fe in either Chloraphyl or Hemoglobin respectively, iirc. We are all human. We all make mistakes, from time to time. Speaking of mistakes, where's that loose goose, Mr. Larson & his buddy The Turd? News alert- tectonic plates are always in motion. Isotopes of concern occur in nature as uranium spontaneously fissions. It also undergoes neutron capture making plutonium in nature as well. Our planet is naturally radioactive and a giant subcritical reactor. Google "keff of the world". Dr. W. is a colleague and mentor. Learn. Yep, the whole American plate is moving, something big is going on and we have front row seats.